This tool was once described as “The healing brush looks like a smart clone tool on steroids”. And indeed the Healing Tool is a close relative to the Clone Tool, but it is more smart to remove small failures in images. A typical usage is the removal of wrinkles in photographs. To do so, pixels are not simply copied from source to destination, but the area around the destination is taken into account before cloning is applied. The algorithm used for this, is described in a scientific paper by Todor Georgiev [GEORGIEV01]. or by clicking on the H keyboard shortcut. The Ctrl key is used to select the source. 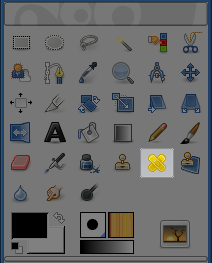 You can heal from any layer of any image, by clicking on the image display, with the Ctrl key held down, while the layer is active (as shown in the Layers dialog). 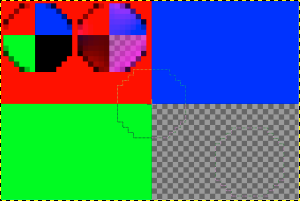 If Alignment is set to “Non-aligned” or “Aligned” in Tool Options, then the point you click on becomes the origin for healing: the image data at that point will be used when you first begin painting with the Heal tool. In source-selection mode, the cursor changes to a crosshair-symbol. Once the source is set, if you press this key, you will see a thin line connecting the previously clicked point with the current pointer location. If you click again, while going on holding the Shift key down, the tool will “heal” along this line. If you enable this option, healing is not calculated only from the values of the active layer, but from all visible layers. 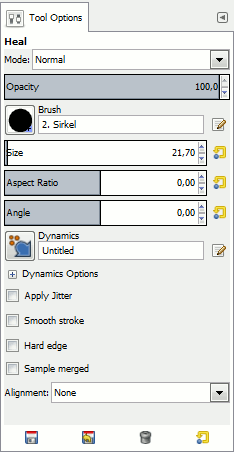 This option is described in Clone tool. Although the Heal tool has common features with the Clone tool on using, the result is quite different. Two black spots in the red area. Zoom x800. The source is where the four colors meet. Cloning on the left spot. Healing on the right spot.